Donald Henderson knows not to overdo it on Christmas decorations. A week after Thanksgiving, Henderson placed a tasteful wreath on the front door, strung a few lights along the front porch railing, and, just to elevate his game a notch or two, plopped an inflatable Mickey and Minnie Mouse on his front lawn, wishing all "Season's Greetings." Tucked behind Mickey and Minnie stood one last touch, a small blue sign that reads, "Happy Birthday Jesus, Come Let Us Adore Him." In this era of culture wars and all-powerful homeowners associations, what came next seems all but inevitable: When Henderson opened his mail on Christmas Eve, he found a letter from the New Bristow Village management company informing him that he had violated one of the development's covenants. Melanie Henderson sits outside her home, next to the sign. The neighborhood association's management firm says only real estate or security signs are allowed. signs - are allowed in the Prince William County development. Henderson was given 15 days to comply. But Henderson, a federal government employee, is keeping the Jesus sign up until Jan. 1, which is when he always removes his holiday decorations. And he intends to post the sign again next year. "When I got the letter on Christmas Eve, I called my wife over and said, 'You're never going to believe this,' " Henderson, 38, said. "I figured we couldn't put up commercial or political signs, but certainly the association could use discretion when it came to religion. "What really bothered me was that they sent it on Christmas. I consider myself a man of faith. The sign shows to all of our neighbors what Christ means to us." Carol Piering, a spokeswoman for the management company, said the sign's religious message had nothing to do with the decision to enforce the rules. "The content of the sign is not why the letter was sent," she said, acknowledging that the warning could have been mailed on a different date. "The letter was ill-timed, and for that we absolutely apologize." She said Mr. and Mrs. Mouse are not subject to the association's rules. "I am going to make the assumption that because it was an inflatable, then it wasn't a sign," she said. Sign battles have been a mainstay of suburban culture for years. Several state courts have ruled that by agreeing to abide by homeowners association rules, home buyers relinquish some constitutional rights. But there are legal limits on homeowners associations. They can't exclude residents based on race, for instance. And they can't bar display of the U.S. flag, although they can dictate how flags are flown. "This is a matter of a private contract, and HOAs are entitled to have declarations, and whatever those declarations are make up the laws of that community," said Mike Inman, a Virginia Beach lawyer and co-publisher of the Virginia Condominium & Homeowners' Association Law Blog. 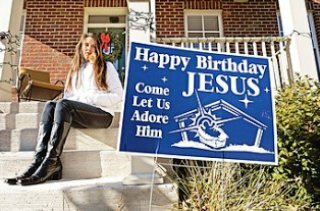 "But it would seem to me that the 'Happy Birthday Jesus' item was not necessarily a sign, but yard decor for the season." Julie Dean, architectural and covenants administrator for New Bristow Village, said she had no choice but to warn the Hendersons after her boss noticed it while driving through the development. "There are definitely rules of the HOA that I don't agree with, but we have to comply," she said. "It's our job to enforce the policies. If I didn't do that, I wouldn't be doing my job." She referred further questions to her boss, who she said was on vacation. After Henderson received Dean's warning letter, he grew furious because his home, a seven-bedroom brick colonial, had been one of several foreclosed houses in the development. No one complained when he bought the house for $390,000 - the last owner had paid about $600,000 for it - and then spent thousands to make the neglected property conform to the community's rules. He fixed a broken window, repaired the mailbox, installed window wells and even replaced the bulb in the sidewalk lamp post. "By the way," he wrote in an e-mail to Dean, "if you ever wonder who the guy is that walks Bristow Station Drive picking up trash from the ground and along the woodline weekly, that would be me." Henderson said he likes private communities because the rules ensure that people keep their yards clear of cars or other junk. What he doesn't like is what he considers a Grinch-like letter on Christmas Eve. "Merry CHRISTmas!! That sign is part of our family's CHRISTmas decorations," he wrote, adding that the village was trying to "deprive" him of his holiday. Still, Henderson said the sign affair hasn't deflated his holiday cheer. After all, he hasn't heard any complaints from neighbors. But he did note that the association sponsors a Christmas decoration contest. Henderson drove over to see the winner's house Tuesday. "The one that won first place has a plastic sign up that says 'North Pole,' and it's got a bunch of reindeer and snowmen," he said. "It's a three-foot sign. Oval-shaped. I took a picture."